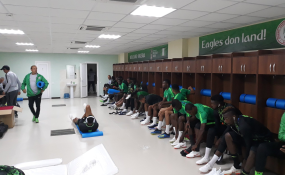 The Super Eagles use customised locker room in Pidgin English with the words "Eagles don land!" The BBC World Service's radio service of English-based Pidgin for West and Central Africa, BBC News Pidgin, is now a year old. And it's thriving. According to the broadcaster it News Pidgin reaches a weekly audience of 7.5 million people in Nigeria and around the world on radio, online, Facebook and Instagram. Even though Pidgin hasn't got the official status of a recognised language anywhere, it's widely spoken across West Africa. Between three and five million Nigerians use it as their first language, while a further 75 million have it as their second language. Pidgin refers to what's known as a trade language that emerged as a mixture of languages to help people who don't have a common one to communicate with one another. In West Africa these mixes include English and French, on the one hand, and local languages on the other. The mixing has developed into lingua franca of the region. The BBC's decision to launch a service in Pidgin should be applauded. Pidgins deserve full recognition because they're being spoken by a sizeable number of people in West Africa. Governments in the region should take a leaf out of the broadcaster's book and ensure the different versions are codified and standardised in both their formal and informal uses. They should be granted official status. Some, if not all, of these pidgins have outgrown their status as pidgins. But they are still called pidgin. One of the reasons it that there's a view that pidgin doesn't have native speakers. This isn't true. In West Africa children and adults use pidgins as their first language. These pidgins are now creoles - that is a language that was a pidgin but has become a first language for a new generation of speakers. In Nigeria for example, Pidgin is viewed as being the language of illiterates even though it's used by both educated and uneducated people in formal and informal activities. It has featured prominently in culture, from Afrobeat superstar Fela Kuti's urban dance music to highbrow opera like in Nigerian-born singer Helen Parker-Jayne's Song Queen: A Pidgin Opera. It keeps changing all the time and it's expressive as well. Sometimes, if you don't have a word for something, you can just create an onomatopoeic sound and just express yourself. And it will be appreciated and understood. This is a Nigerian Pidgin way of asking "what is happening?" or "what happened?". "Wetin'" is a distortion of "what" or "what is", while "hapun" is spelt as pronounced. This means "the car is fairly used"; "the car is second hand" (Nigerian English) or "it is a used car". The word "tokunbọ" is borrowed from the Yoruba language but used to describe fairly used items in the Nigerian pidgin.